Did you know that one blistering sunburn in children can double their lifetime risk of melanoma, which is the deadliest form of skin cancer? Young skin is more sensitive and thus especially vulnerable to damaging sun rays, so it's important to protect your children and instill proper skin care routines in their lives. When choosing a sunscreen, the first and most important aspect to look at is its SPF (sun protection factor), which is an indicator of how effective it is in preventing sunburn. It's recommend to use sunscreen with an SPF of at least 15, but the higher you go, the better. For children under 6 months, their skin can be too sensitive for sunscreen, so you should focus on covering them up with clothing and shade. Use clothes that cover the baby's sensitive skin and try to keep them out of the sun when UV rays are most intense. This is between 10 AM and 4 PM. With young children, have them stand with their arms stretched out (just like their favorite flying animal) and cover their entire body with sunscreen. Also consider using other ways to protect their skin like with sun protective clothing. Remember, when it comes to skin care, it's important to make it a ritual from early on. Teach your kids that if they're going in the sun, protecting their skin is just going to be a part of that routine, no matter what. Instilling this idea in them at a young age will help protect them for their whole lives. 1. Cover it all: Children tend to run around a lot, especially at the beach or pool, so don't just cover the areas that their bathing suit doesn’t cover. Go a little past bathing suit lines to account for movement. 2. Plan ahead: Never wait until you get to the beach to apply sun screen. If you have children, you know that as soon as you get there, it's play time in their mind and getting them to stand still while you apply sunscreen isn't easy. 3. Liven it up: For younger children, use sunscreen that's colored or make it a game. If you make it fun for them, they're less likely to whine during those minutes you're making them stand still. For children that are older and more concerned with their appearance, start teaching them about the harmful effects of the sun. 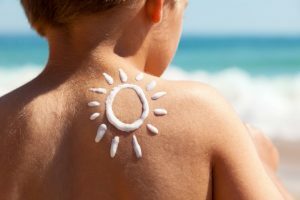 Telling a teenager that a sun burn will cause them to break out or lead to wrinkles may be just enough to get them serious about sun protection. 4. Reapply strategically: Sunscreen needs to be reapplied often, especially if your fun in the sun involves water. Think about it strategically and plan when you’ll reapply, not just on the kiddos, but on yourself, too! If you brought lunch to the beach or pool, let the kids eat in the shade and then reapply before sending them back out in the sun. Call them back for more snacks or a drink and reapply while they enjoy their treat. Remember, while sunscreen is absolutely necessary for days at the pool, beach, park, or events in the sun, it's important for everyday activities too – even days that are overcast. Instilling good habits in your children while they're growing could help protect them for the rest of their lives. Be a role model and wear sunscreen every day, too.Want more ways to let your kids enjoy their time outside? Discover how JumpSport can become part of your family’s sun-day fun-days.